The board shown above has 5 connectors for scanners, two MIDI sockets, and screw terminal for power supply. 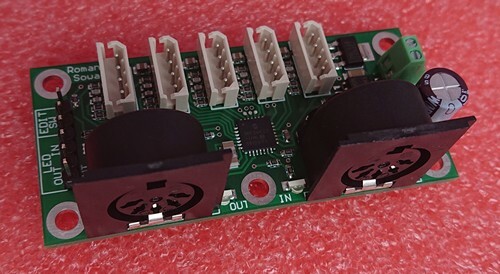 There is also 6-pin header for connecting the "EDIT" button, and optional external activity LEDs. There can be 5 chains of keyboard scanners (only up to 2 per chain), and 1 chain of potentiometer scanners (up to 64 pot inputs total).